OAKMONT, Pa. -- To occupy the same tee box with Dustin Johnson is to be in the presence of an athletic marvel, the kind you could picture suiting up with LeBron James and Steph Curry in Game 7. As Johnson prepared to hit the first drive of his third round Saturday, he stood near the mighty-mite longshot, Andrew Landry. They looked like a father-son pairing on Father's Day weekend. "The Great One" and the 31-year-old golfer made eye contact before the round. Wayne Gretzky, Johnson's father-in-law-to-be, had been on the Oakmont premises and had told people on the grounds he was proud of how Johnson had carried himself since his 2015 leave of absence, taken, the player said, "to seek professional help for personal challenges I have faced." Johnson predicted he would return from that counseling "better equipped to fulfill my potential and become a consistent champion." Gretzky was the ultimate consistent champ, a four-time Stanley Cup winner. But at 6 feet, 185 pounds, he wasn't the specimen on the ice that his daughter's 6-4, 190-pound fiancé is on the course. And that's one reason why Johnson should take this U.S. Open by the throat Sunday and shake it until everyone else in the field has dropped to their knees. It's Johnson's time to win a big one. At 31, he is in the heart of his prime and still young enough and strong enough to power through the scar tissue left by opportunities lost at majors that could've and should've been his. Johnson has more physical skill than any fellow contenders; he is what NFL executives would call the best available athlete on the board. Of greater consequence, Johnson is in picture-perfect position to shed the burden forever belonging to golf's BPNTWAM. Best. Player. Never. To. Win. A. Major. When third-round play was suspended due to darkness, Johnson stood at 2 under, 3 strokes off Shane Lowry's lead. Once they finished Sunday morning, Lowry reached 7 under, increasing his lead by 1 on Johnson and Landry, who were both tied for second at 3 under. On the surface, this would seem to be an alarming position for a man who had Johnson's final-round history in the majors, and who held a 2-shot lead after birdieing No. 1 on Saturday. But on a deeper level, Johnson might benefit from a good night's rest without having to worry about blowing a lead. There will be an awful lot of pressure on Lowry, a 29-year-old Irishman with one PGA Tour victory, a couple of wins overseas and no clue what it's like to suddenly be the man to beat at the U.S. Open. Landry, sitting in second place entering Sunday morning's restart? He has never finished in the top 40 of a tour event. Sergio Garcia and Lee Westwood, the contenders tied with Johnson when play was suspended at 8:49 p.m.? Their major championship demons make DJ's look pale and insignificant, and would require three more "Ghostbusters" sequels to eliminate. 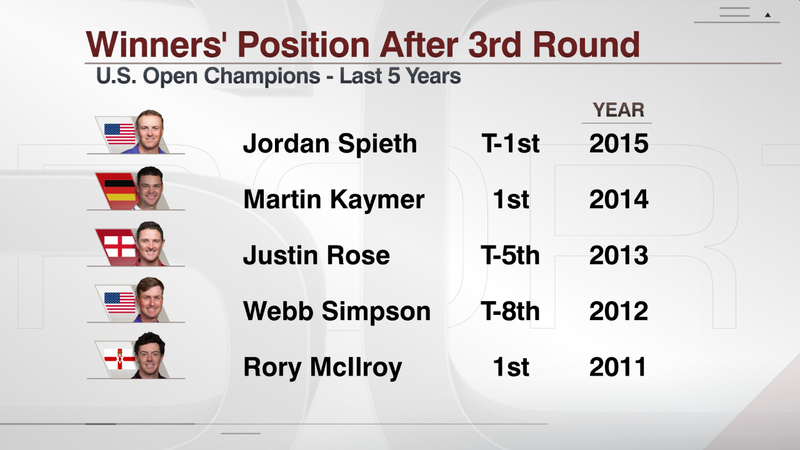 Rory McIlroy missed the cut, Jordan Spieth is out of contention and Jason Day left the course Saturday night at 1 over. When is it ever going to get better than this for Johnson? If he can't find a way to outlast Lowry, Landry and the Euro stars who are much better off on Ryder Cup teams than they are out on their own, who is Johnson going to beat? "The longer it goes," Phil Mickelson said of a major championship drought, "the more challenging it becomes. ... The more it's discussed, the more you start thinking about it. The challenge is really on Friday and Saturday nights, when you have opportunities and you start putting that self-imposed pressure (on yourself), because then you never play free." Mickelson broke through at the 2004 Masters, at age 33, and frankly he was hounded about his big-game failures a lot more than Johnson has been. DJ gagged away the U.S. Open to Spieth last year with his rushed 3-putt on the 72nd hole at Chambers Bay. He led the Open Championship after two rounds at St. Andrews a month later and then barely finished inside the top 50. He sent his hopes whistling out of bounds at Royal St. Georges in 2011, and he grounded his club in a bunker at the PGA Championship the previous year to cost himself a spot in a playoff. Two months before that at Pebble Beach, he carried a 3-shot lead into the final round and shot 82. Johnson has 11 top-10s in the majors and five top-5s. It's high time he earns a top one. "I feel like my game, in those situations," Johnson said the other day, "has held up just fine the past few times I've been in this situation." He said that with a straight face. When Johnson hooked his tee shot at No. 2 Saturday off a spectator's head, into a refreshment stand selling ice cream bars and freshly squeezed lemonade, and behind a blue tub of ice, a fan shouted, "He's sh---ing the bed already." Johnson responded by taking his drop, hitting a brilliant recovery shot that stopped above a deep, greenside bunker and then executing an even better chip to save par. But Johnson double-bogeyed the third, falling into a tie with Landry, changing the tone of the game. "Felt like I hit a lot of good putts that didn't go in the hole," Johnson said, "just burning the edges. A few lip outs. But I mean, it's the golf course. It's tough to make putts on it. I'm still feeling good about where I'm at. A lot of golf to go. Golf swing feels good. So I'm happy with where I'm at." Johnson was asked if his experience could provide him an advantage over the Lowrys and Landrys. "Yeah, it could only help for sure," he said. "I've been in the position before. I know what to expect. I know how to handle it." Not quite. If Johnson knew how to handle it, he wouldn't have an empty major championship trophy case back home. "I still feel young," he said the other day, but that feeling won't last forever. Among the contenders under par, Dustin Johnson is the best player and athlete by a long par-5. This is his time and his tournament. In other words, if not now, when?